How should a young man dress for prom? Equally important, where should he shop? 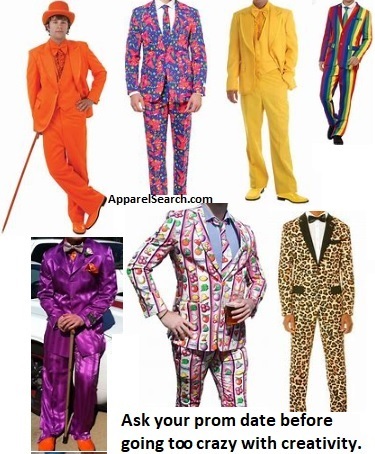 If you are planning to attend the prom, step two should be to find out if your school suggests a "suit" OR a "tuxedo". These are two entirely different garments. The article below is regarding prom suits. By the way, step one, should be to first find a date (going alone is fine as well). If you are looking for a suit for the prom, you are probably no longer shopping in the kids section. Now you are a man. Time for a mans suit. Unfortunately, this concept comes with high expense. Buying a suit is not an inexpensive purchase. Keep in mind that in addition to the suit, you will need a dress shirt, belt, dress shoes, and most likely a tie. If you have not actively been working to save up money, we suggestion you start being extremely nice to mom or dad. Doing extra chores around the house and cleaning up your room would be a good idea. You are very possibly going to need their help with this purchase. Are you still growing? If you are still growing taller, you want to look good at prom but you also don't necessarily want to break the bank paying for a suit that you will wear once or twice. If you are done growing, you can think of your prom suit as an investment. If you shop wisely you can wear it to prom, and the same suit for many more special occasions and possibly employment. Before you head to the mall or specialty retailer, you may want to first learn a little bit about suit fabrics. If you don't wish to read the entire post about suit fabrics and just want a summary, here are a few tips. Ask the sales person what "weight" is best for the time of year and climate in your area. You don't want to purchase a fall weight fabric if you live in a hot climate. Also, discuss the fiber options to see what is most appropriate for your budget. Whether you're shopping for a classic navy suit or black suit, a perfect dress suit or business suit, style isn't one-size-fits-all. When selecting for an event such as the prom, you will have many issues to consider as well. Do you wish to be very conservative or do you wish to make a statement with creativity. If you are going to be super creative, you may want to give your date a little advance notice so she knows what to expect. If she is going classic, she may be caught off guard if you show up with a bright orange suit and purple cowboy boots. In addition to the color, you want to pay VERY close attention to the fit of the garment. Tailored clothing needs to fit properly to look proper. It is important to work with an experienced sales person that understands the proper fit of a suit. They will help you with determining the proper chest measurement, length, waist, etc. Learn about suit measurements & size charts. Keep in mind when selecting a suit (matching top with same fabric bottom), you need to carefully select the proper top measurements as well as proper bottom measurements. A good option is "suit separates" (you can ask the sales person to explain to that you concept). 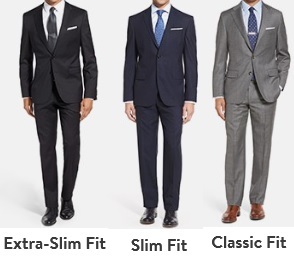 After you figure out your general size, you will also need to select between classic fit, slim fit, etc. Again, here at Apparel Search, we strongly suggest you work with an experienced tailored clothing sales person to help guide you throw the fit process. Also, check with a tailor. Here are a few links to suit stores for prom that may be of help. 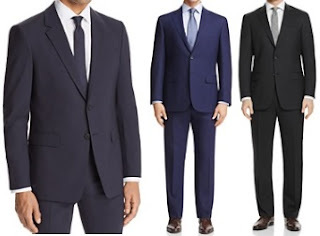 Brooks Brothers Suits - Classic men's clothing & apparel from Brooks Brothers. Legendary quality & customer service. Are your parents rich? If you are not concerned with the price tag, this obviously opens you up to additional prom suit options. Those of you with unlimited funds, you can visit some of the luxury retailers and purchase designer brands. You may also want to learn the difference between bespoke and made to measure. The other option is off the rack which also can provide a very fine tailored garment. Neiman Marcus Designer Suits - brands such as Emporio Armani, Tom Ford, Isaia, Brioni, Boss, Ermenegildo Zegna, etc. Bloomingdale's Men's Suits - brands such as Hugo, Canali, Boss, Theory, Hugo Boss, Hart Schaffner Marx, etc. If you don't have the budget to purchase a suit for prom, you can also investigate renting one. That is a very good option. Are you looking to impress your friends on prom night? Well, don't. It is important to impress yourself and most importantly impress your date by acting like a gentleman at all times. Looking good, and acting even better is an important aspect of prom night. Don't forget to treat your prom date like a queen. You are lucky to have her with you. Treat her with respect and remember that the night is important to her as well. Open the door for her, bring her home on time, and be a gentleman at all times. By the way, after you finish picking out the perfect suit, you may want to read up on how to pick out a dress shirt. In addition to dress shirts, don't forget a nice belt, dress shoes, and a tie. If you are going to pick an off-the-rack suit, bespoke, or made to measure, be sure to try the suit on well before prom night. Don't wait for the last minute to make sure everything fits properly. You may want to look for suit stores in the mall clothing store directories. You can do this at the mall or online before you travel to your local shopping mall. Thank you for taking the time to read this men's prom fashion blog post. We hope that you have found this fashion blog post to be enjoyable. If you have comments or questions, please add your thoughts in the discussion area below.